1. Place ingredients into a blender and puree until smooth. 2. 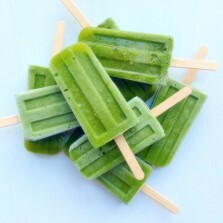 Pour green smoothie mixture into popsicle molds & freeze for 4-5 hours or until firm. This recipe makes 8 popsicles (1/3 cup each). PS: Add 1/4 cup hemp seeds or use 2% organic dairy milk if you are using these as a post-workout recovery snack. Your body wants protein after workouts. Carrot Mango: 2 cups cubed mango, 1 cup shredded carrots, 1 teaspoon cinnamon, 2 cups coconut water. Chocolate Beet Berry: 1 banana, 1 cup strawberries, 1/2 cup peeled chopped raw beet, 1 tablespoon unsweetened cocoa powder, 2 cups coconut water. Popsicle freezer she pulled them out of …… What was it?? I made these after watching your show!! We loved them!! Can be your favorite like unsweetened vanilla almond milk. You can also use 2% dairy milk. Can you substitute Kale for spinach? Any changes in prep needed? Yes! Raw kale leaves (no stems) work great in smoothies/popsicles. No change in prep needed. Would skim milk work in place of plant milk? Is that consistency okay? Yes, skim milk would work. I recommend 2% organic dairy. The little bit of milk fat contains something called CLA that may help exercisers build muscle & burn fat. Dairy milk adds a nice amount of carbs + protein to these popsicles to make them a good choice for a refreshing post-workout treat! I can’t eat bananas. Would another fruit work? I have a Zoku too! On the show, I could have sworn I heard you say that there was almond butter in these green smoothie pops. Am I right? If so, how much?…in ratio with the above recipe? You can eat them as is OR…if you are using these as a post-workout recovery snack (which we were on the show) you need to add PROTEIN. Your body likes protein after workouts to heal worked muscles. So add 2 tablespoons almond butter or 1/4 cup hemp seeds or use 2% organic dairy. I tried this with strawberry kefir in place of nut milk and I steamed and cooled my greens first (because of my sluggish thyroid). The goop tasted great, I can’t wait to taste the frozen product! Love Kefir! Try plain 2% kefir & add your own fresh strawberries to keep added sugar count down. The most important thing for your thyroid isn’t cooking the greens as much as it is making sure your diet has enough iodine. That’s the most protective for a thyroid. Iodine is found in seaweed, especially dulse. I love this stuff as a delish seasoning: http://amzn.to/1Un1Qpm. What is the best way to measure the greens? I tried to measure 225 grams (1 cup) worth of greens and ran out before reaching that amount, and there was so much of it! Do you have any tips for measuring greens for a recipe? Generally 1 cup = one handful. But…use as much as you can! Overeating greens is good-for-you! PS: I also have ALL NEW swap recipes coming out in a book later this year (12-27-16). I have type 2 diabetes; is there an alternative to the banana that can be used? My clients w/ diabetes still eat bananas. Bananas are much healthier than other types of sugar people eat! I have my diabetic clients limit how much overall fruit they eat to 1 piece or cup each day (sometimes 2). If you really don’t want to use a banana…mango or berries also taste great! Can you freeze this in an ice cream maker? Congrats, by the way, I was rooting for you! Thanks for the love & support through the show! Hey! I’ve never tried this in an ice cream maker! The popsicle molds we use are actually pretty similar to an ice cream maker because they are frozen metal so it just may work! Let me know!! Here are the molds: http://amzn.to/1JWQoAt. Well, it froze to a nice slushy consistency in the ice cream maker but then froze solid when I stored it in the freezer–basically a giant popsicle! I guess you would need to add more sugar to make the ice crystals smaller but that defeats the purpose, right? So I suggest sticking with the little molds! I have a sweet tooth. It has been hard to find a sweet recipe that satisfies my taste buds and is healthy at the same time. I have lost 3 pounds within the past week with your recipes. Thank you very much! Glad you will try them! Let me know how you like them!